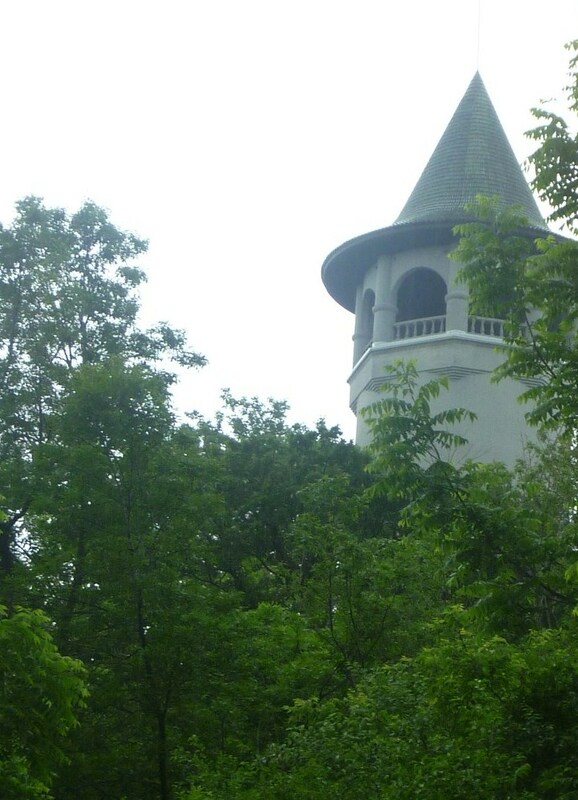 I finally climbed the Witch’s Hat Tower in Tower Hill Park. The erstwhile water tower was completed in 1914 after the park was acquired by the Minneapolis Board of Park Commissioners. I have already written about the tower here and here and here. Today I’m just providing proof of my climb with photos and a few brief observations. Most years the tower is only open one night a year, the night that Pratt School has its ice cream social, which was last Friday, but this year the tower will also be opened to celebrate the dedication of the tower 100 years ago. That will take place July 12 and 13. So you get an extra chance to see the view from the top this summer. If you took better photos than I did, please email them and I’ll post them here. A Missed Opportunity: The Witch’s Hat Is Closed for Another Year! 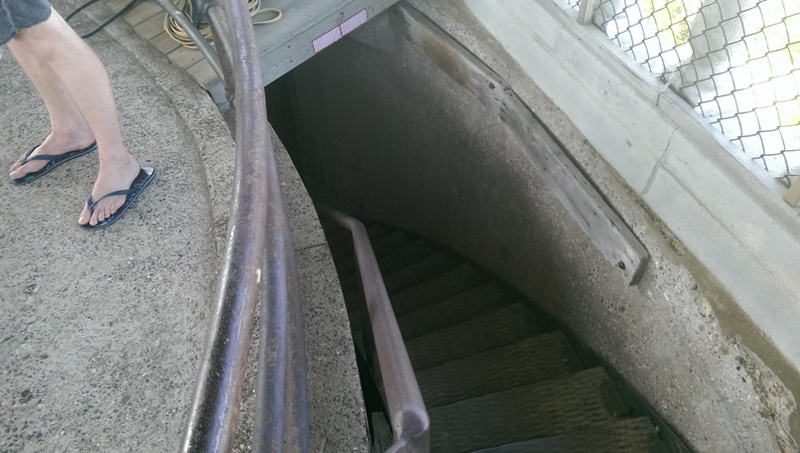 For years my “To Do in Minneapolis” list has included a climb that I have never made. And it’s not something I can do just any old day. We get one evening a year and that’s it. And once again I missed my chance. I wasn’t paying close enough attention that the Prospect Park/Pratt School Ice Cream Social was May 31. The night of that neighborhood party is the one time a year that the Witch’s Hat Tower on Tower Hill Park is open for climbing. The climb would have been especially gratifying this year because it was the tower’s 100th birthday. The City of Minneapolis built the water tower on the hill, with the park board’s permission, in 1913. As explained before, the park was already named Tower Hill, at the request of neighborhood residents, when the Witch’s Hat water tower was built. 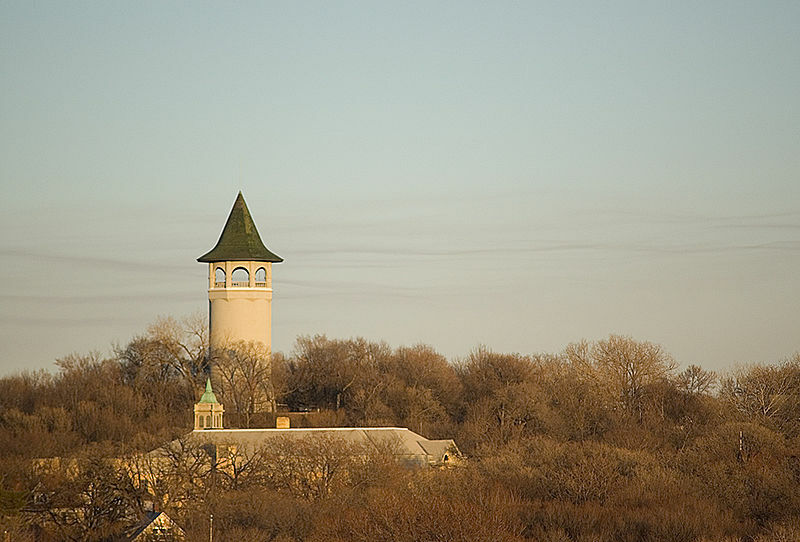 The Witch’s Hat tower was designed by Frederick Cappelen, as noted on a plaque that was put on the tower in 1999. I have a complaint about that plaque. Cappelen is described on the plaque only as a “Norwegian architect.” Concise, but really misleading. Yes, he was Norwegian by birth, but he had immigrated to the United States at the age of 23 in 1880. He went to work for the City of Minneapolis in 1886 as a bridge engineer and in 1893 was elected Minneapolis’s City Engineer. He left that office in 1899, but was elected City Engineer again in 1913 and held that title until he died of complications from appendicitis in 1921. So, although Norway-born, he lived nearly his entire adult life in Minneapolis and during much of that time was a city employee. Cappelen’s greatest achievements in Minneapolis had nothing to do with the Witch’s Hat. He was the designer of the Franklin Avenue Bridge over the Mississippi, which was completed after his death. At that time, the bridge was the longest concrete-span bridge in the world, with a central span of 400 feet. 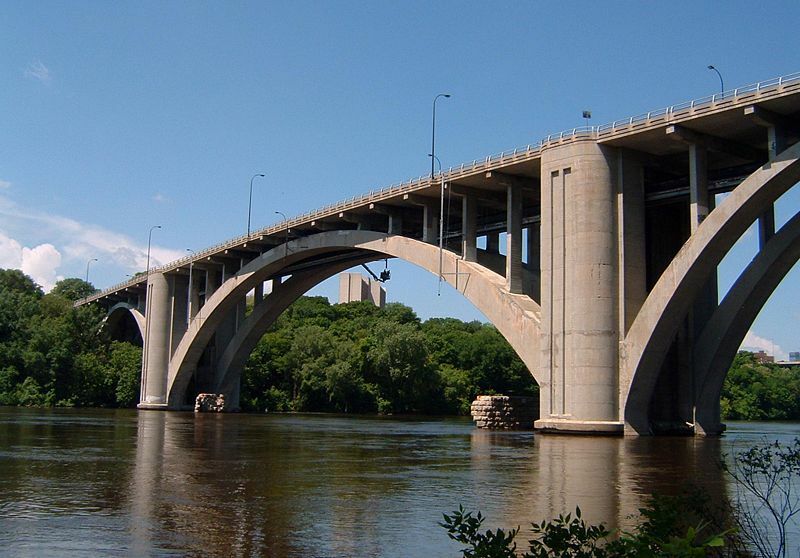 The bridge’s official name is F. W. Cappelen Memorial Bridge. Cappelen was also a key figure in designing the city’s water distribution system from the 1890s into the 1900s. He was so well-known as a bridge designer and a water works designer that his obituary was included in both the Proceedings of the Society of American Civil Engineers and the Journal of the American Water Works Association. Here’s my complaint about the plaque. I have no problem with identifying him as a “Norwegian architect” despite the fact that he was as American as everyone else in the city. My problem is with not identifying him as a public employee, as the City Engineer, a description that has far more to do with our memory of him than that he was Norwegian by birth. The omission of his status as a public employee is part of my larger complaint that too many people praise everything in the private sector and disparage everything and everyone in the public sector. Too many people have such blind reverence for business methods and profit motives that they cannot distinguish between public and private good and the sometimes vastly different challenges involved in each. Some public problems cannot be solved by methods designed to maximize private profits. I have also witnessed first-hand brilliance, stupidity and sloth in both government and corporate worlds. I have known very successful business people whom I would not trust to walk my dog around the block for fear that they’d screw it up somehow — or sell my dog before they made it back. I have known public employees with whom I would trust my life. I have no tolerance for people who assume that someone who gets his or her paycheck from a government entity is incompetent and that everyone who works for a profit-making enterprise is more industrious and resourceful. I have as much tolerance — none — for those who assume the only reason we have parks at all was a conspiracy of capitalists to enrich themselves. This myopic view, in my recent experience, seems particularly prevalent among people writing doctoral dissertations and some of those advising them. To emerge from our present political quagmire, we have to be better than those extremes. If there is a valuable lesson in Minneapolis park history it is that a great variety of people, with disparate philosophies and political views, have worked together on issues of the common good and achieved marvelous results. They included “capitalists” who looked beyond self-interest and profit, and they certainly included talented and dedicated public servants — like Frederick William Cappelen, City Engineer. I’m sorry I missed again a chance to climb the tower he imagined 100 years ago. I’ll have to settle for a walk over his bridge. NOTE (6/6/2013): abockheim raises an excellent point in a comment on the post I linked to above about the identity of the tower that led to the naming of Tower Hill. Can anyone shed light? Here’s the link to the above illustration. I can’t picture this view from the campus or Tower Hill. A fifth Prospect Park triangle was added to Minneapolis parks inventory in 1919 when the City Council turned over a 0.03-acre triangle at the intersection of Bedford Street and University Avenue S.E. 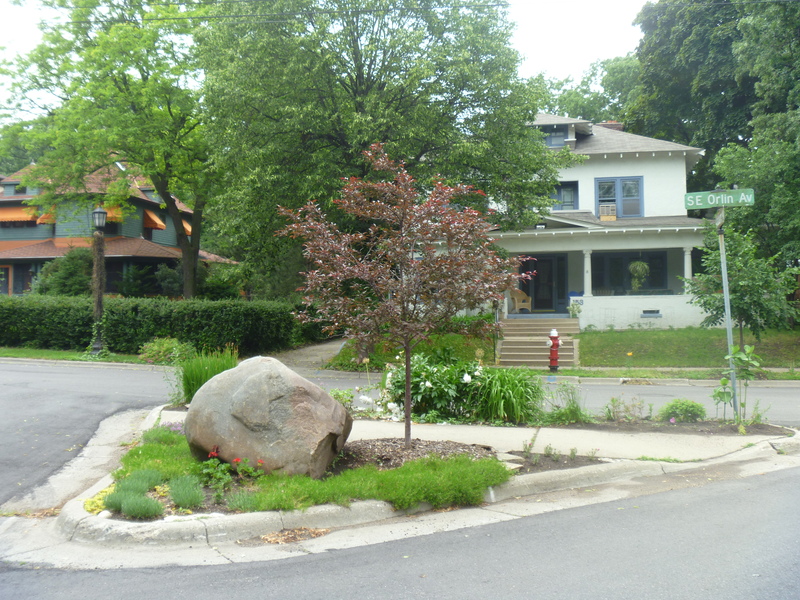 The Minneapolis Board of Park Commissioners (BPC) instructed the superintendent to plant shrubbery on the triangle and to maintain it. It was named Midway Triangle. The City Council must have forgotten that it gave the land to the BPC—or ignored the fact—because in November 1944 the BPC adopted a resolution that “inasmuch as the intersection of University Avenue and Bedford Street, including what was formerly Midway Triangle, has been paved,” it was turning over the land to the City Council. There is still a remnant of the triangle at the intersection, just enough curbed space to hold a traffic signal, a light post and some signs. 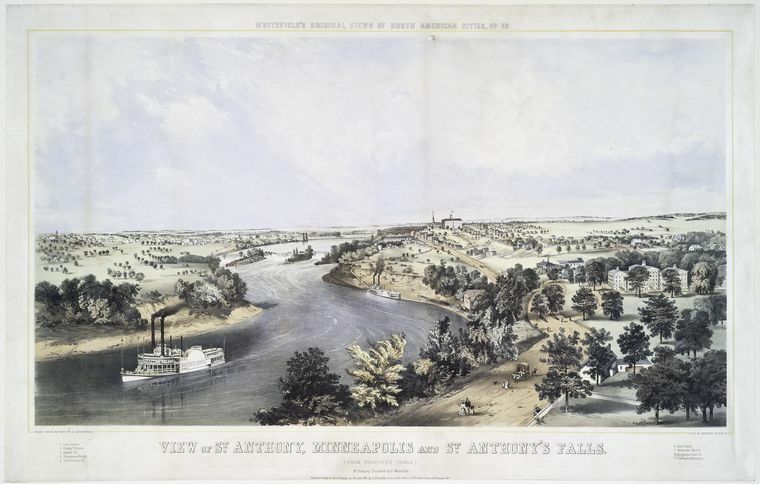 The entire neighborhood might have looked quite different if the Minneapolis park board had acted on John Pillsbury’s proposal in 1887. Pillsbury was the former Governor of Minnesota and former Minneapolis park commissioner and still the president of the University of Minnesota’s Board of Regents at the time, who had just donated a $150,000 building to the University. He proposed that University Avenue be made a parkway from Central Ave. to the county line (the boundary with St Paul) and that from Oak Street east the parkway be 120 feet wide, or more than 50% wider than it is now. That might have been spectacular, but it is also possible that a parkway on University Avenue would have suffered the same fate as early parkways on Hennepin Avenue from Loring Park to Lakewood Cemetery and Lyndale Avenue North from Loring Park to Farview Park. They were eventually abandoned by the BPC as parkways and returned to the control of the City of Minneapolis, because they carried too much traffic to be true parkways. I suspect the same would have happened to a parkway on University Avenue; it was a major thoroughfare. But it’s fun to speculate and try to picture a beautiful wide boulevard approaching the University of Minnesota from the east—in the shadow of Tower Hill. The Award for Prettiest Triangles Goes to….Prospect Park! 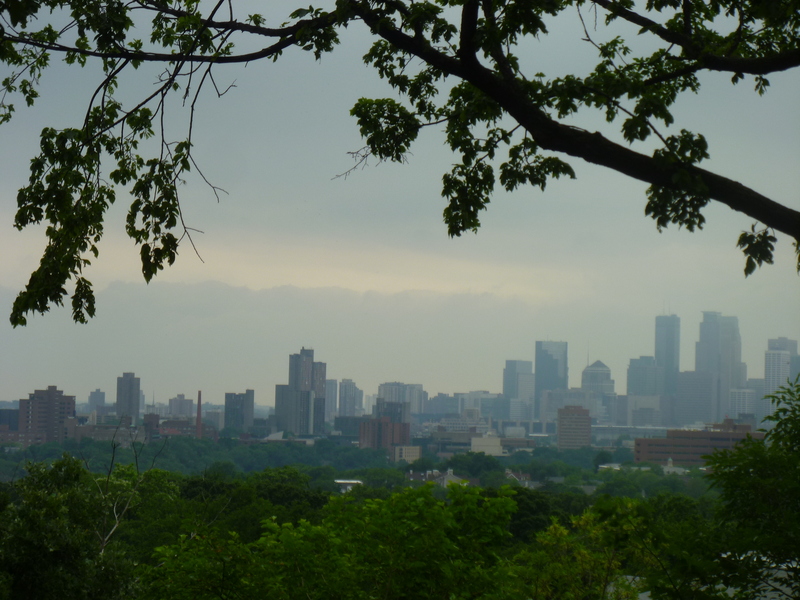 The prettiest little parks in Minneapolis are in Prospect Park. I visited that neighborhood recently — it’s not a place you pass through conveniently on your way to anywhere else — to see what kind of damage the Emerald Ash Borer had done to Tower Hill Park. Last year nearly 80 diseased ash trees were removed from the park in which the green beetle had staked its first claim in Minneapolis. I anticipated seeing the Witch’s Hat on a bald head. Not so. Other species, especially the old oaks, make the absence of ashes barely noticeable. Several new trees had been planted, but the vegetation around the hill and tower is very dense. Given the weather of the last few months, the park, as well as the rest of the neighborhood, had the feel of a rain forest. The gentle mist at the time exaggerated the effect. While in the neighborhood I wanted a closer look at the street triangles that are owned as parks by the MPRB. My recollection from visiting them a few years ago was that they were among the smallest “parks” in the city and the MPRB inventory lists Orlin Triangle (SE Orlin at SE Melbourne) as one of six triangles that measure 0.01 acres. The other one-hundredth-acre parks are Elmwood, Laurel, Oak Crest, Rollins and Sibley, all triangles; however, all but Elmwood appear to the naked eye to be considerably larger than Orlin. 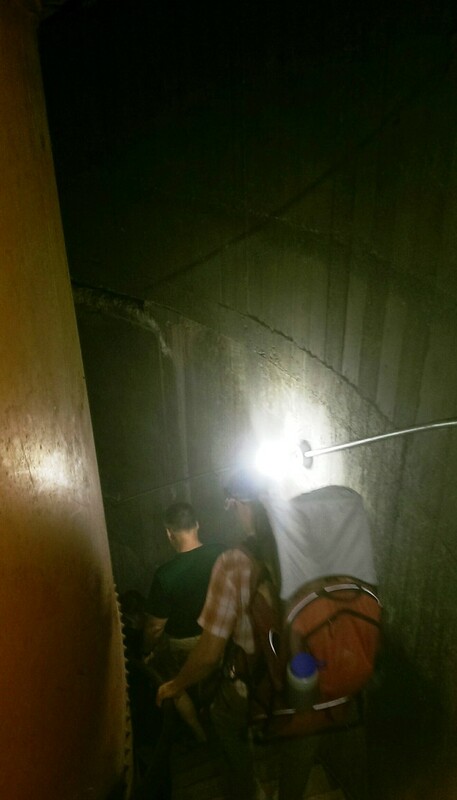 Orlin Triangle measures roughly 30 feet per side. What’s remarkable about the triangle though is that it is a little garden. The unifying element of the little triangle gardens in Prospect Park is that each has one, two or three boulders. Orlin Triangle, the littlest and one of the prettiest parks. 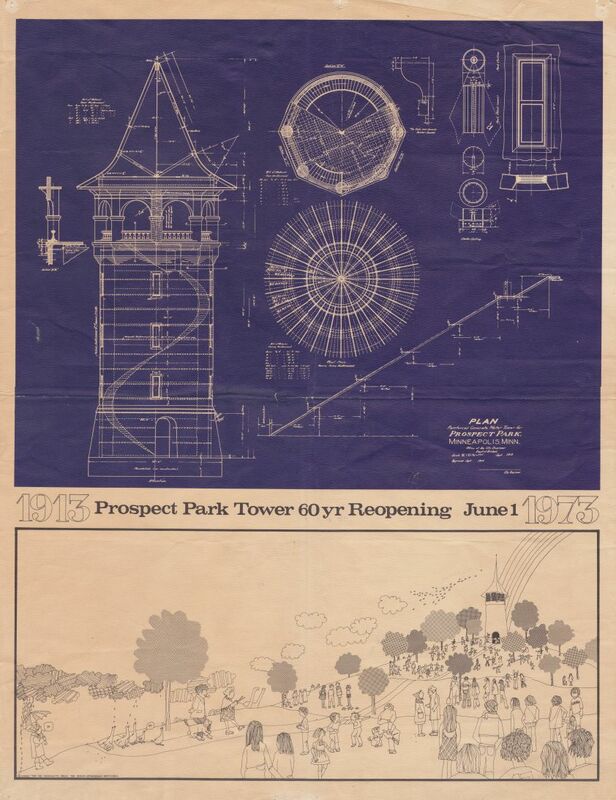 The first record I can find of requests to have the park board take over Prospect Park street triangles was in 1908. In response to a petition from the Prospect Park Improvement Association, the park board agreed on September 7, 1908 to plant flowers and shrubbery on the triangles and care for them if the neighborhood would curb them and fill them with “good black soil,” and “obtain the consent of the City Council to the establishment of such triangles.” The triangles were apparently at that time just wide and probably muddy spots in the roads. The association reported in November of that year that the triangles were ready for planting. There is no indication in park records of how many triangles were involved or exactly where they were. Nor is there any record of whether the park board planted the flowers and shrubs as promised, or cared for them. The next time I can find those properties mentioned in park board proceedings is 1915 when the City Council officially asked the Board of Park Commissioners to take control of four triangles in Prospect Park, which the park board agreed to do in October, 1915. In November the board named the four after the streets on which they were located: Barton, Bedford, Clarence and Orlin. Bedford was at some point paved over and no longer exists. The mystery triangle at Clarence and Seymour. Love the maple tree. That’s Tower Hill Park in the background. 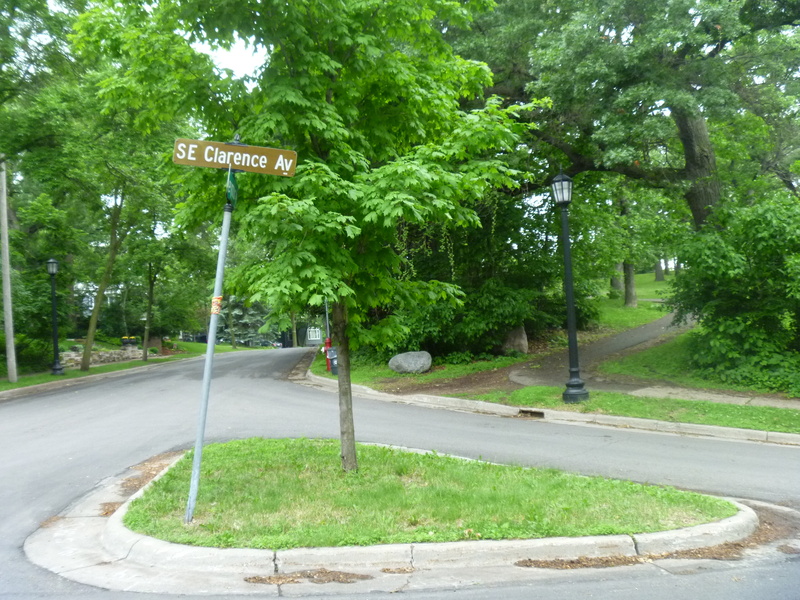 As for Clarence Triangle, its official address is listed in the middle of a block of houses and there is no traffic triangle at the corner of Bedford and Clarence where it is supposed to be. There is a triangle, however, at Clarence and Seymour, which is considerably smaller than the 0.02 acre that Clarence Triangle is listed at. If this were a park triangle it would easily be the smallest in the park system, measuring only 20 feet per side. Somebody must mow the grass around the little maple tree. Did MPRB plant the maple tree or did someone else? Was it the same someone elses who maintain the other triangles in Prospect Park? The other impressive non-park triangle in Prospect Park is at Orlin and Arthur. This is a three-boulder triangle blooming with gorgeous flowers. I’m sure the rest of the park system would be honored if this, too, were an official triangle park. These little gems of gardens are what the park founders had in mind for the park system. They didn’t imagine giant sports complexes or ball fields in parks. They imagined parks to be little places of beauty — civilizing natural beauty — which is why they agreed to make parks of small odd lots at street intersections anyway. 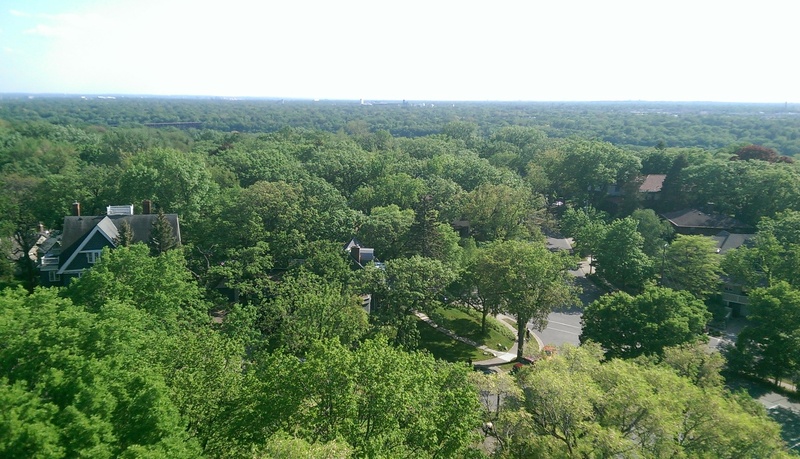 When you see the triangle parks of Prospect Park, you will understand better the intentions of the founders of Minneapolis parks. Somebody deserves an award for maintaining those beautiful triangles, I just don’t know who to give it to. If you do, let me know. The runner-up for prettiest triangle is Laurel Triangle at the intersection of Laurel Ave. and Cedar Lake Road in Bryn Mawr. Whoever planted and tends that garden deserves praise too.